On getting confirmation from Robert Danken that he agreed to proceed, Paul set about obtaining finance for the project and formed EMERYSON EXPERIMENTAL LTD. as it was the intention to market a number of components featured in the design that were not currently available. Peter re-configured the design of the 500cc with only a few changes required to make it larger for the new Formula Junior; a little longer and wider and increasing the space frame tube diameter. The design change included adding six inches to the wheel base and 3 inches to the track, along with a quarter of an inch to the frame tube diameter. The Morris Mini uprights that Peter proposed to use for the 500 car would not need to be shaved away as for the 500 formula. This had been one of the major workshop jobs, removing all the excess appendage from the B.S.A front uprights that were used for the 250. The FJ was initially designed for the new Ford 105E engine mated to a highly modified VW transmission driving out through the front wheels but Danken expressed a preference for the BMC A series unit, to drop it into the lower 1000cc class. Peter designed and cast a revolutionary side mounted gear input for the VW box, a design that was to be replicated on Hewland modified transmissions in later years. The Formula Junior was not to have the favoured swing axel as on the 250 car but instead heeding Paul’s advice, Dankin insisted the swing axle be dispensed with in favour of the Chapman strut which at the time it looked like a good idea. Peter was apprehensive as he felt that the induced side loads of Cornering and braking could adversely affect critical damper performance settings that would be required for such a light weight rear end. 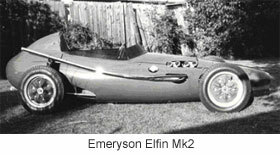 With his wife Jeanne’s help in looking after the brake drum business, laying up the glass- fibre body panels and curing them in the sitting room because of the cold weather, the new Emeryson ELFIN Mk1 was constructed in less than five months as it had to be at London airport by mid May for despatch to the USA. Prior to the cars departure there was little time to carry out much testing and also being wet at Eelmore, the testing area at Blackbush Airfield, very little set up was able to be carried out and so Peter was still unsure about the switch from swing axle to Chapman strut. The limited testing that was carried out the car certainly had little roll and no perceptible under steer but the adjustable rear dampers provided had needed some fine tuning on bumps. 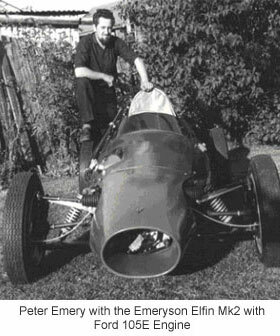 Paul at this time on behalf of the organization at Connaught with Allan Brown, contracted Emeryson Experimental to design the space frames for his companies Formula Junior, with the 1100cc dry sump version of the Ford 105E based engine and the Formula one with the Climax engine. Agreement was also made whereby Peter would design the new parts, build and prepare two engines, one for Emeryson Experimental and one for Emeryson Cars, for a payment of £250 to cover Emerysons Experimental’s mechanics time in respect of the engine for use by Connaught. It was also agreed Connaught’s would fund the manufacturing cost of the new parts that would be used to build the two engines. In retrospect it was bad move as Connaught was experiencing financial difficulties. This included the new fully finished steel camshafts that Peter had already manufactured and they would carry out the machining of the castings for both engines free of charge. This seemed to be a satisfactory arrangement to cover the two prototypes. Progress from there on would depend on its performance. Emeryson Cars/ Connaught, had all the manufacturing facility and sales talk as it turned out, whilst Peter had all the design skills and drawing office facility. Apart from the initial meeting with Allan Brown and Co., Peter had little direct contact with any other directors other than Paul and the director of the Machining facility; Once agreement had been reached on who was going to do what; with a clear understanding on pooling of resources and restrictions on in-house changes, Connaught agreed to pay Peter a basic hourly rate for the frame drawing details that had been supplied. The work load at the time however required Peter to outsource the detail drawings. A few weeks after having providing the drawings Peter visited the factory to see how things were progressing and it was found that Paul had not followed the detailed drawings to the letter and with out consulting Peter, had moved many of the suspension points. Believing there was in sufficient room for the engines he had moved these attachment points as well. The changes had in the process nullified the whole stress analysis. Peter, exasperated, insisted that we could not continue like this and that it was becoming a repeat of Paul’s pre-war difficulties with himself and George. After reviewing the project Peter decided he would have no more involvement with or anything to do with the cars themselves. He would only continue with the Formula Junior engine project and take no further part in the chassis design. Things continued to deteriorate when the castings for the new parts arrived at Surrey it soon then transpired that there was no formal agreement as to who was responsible for the machining of them. Paul’s organization was now requiring Emeryson Experimental to pay for machining the parts despite having done all the space frame design work free of charge. After what Peter believed to have been an amicable solution was settled on, non payment prompted him to withhold delivery of the FJ engine that had been prepared for the Commander York Trophy. . Whilst he was away, this led to the breaking into and entering of Peters premises that the engine was stored in. Police having been called by neighbours would not stop the removal, deeming it to be a family matter. Payment was never received of the agreed fee. 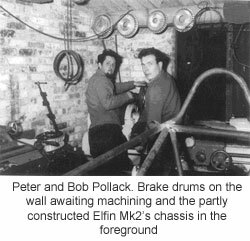 The saga continued when Peter received a demand for the return of a lathe that was on loan from Paul to make the blanks for the new steel camshafts and now set up for machining the brake drums. This brought a halt to Emeryson Experimental’s supply of brake drums to Lotus and Lola and other companies. All of this was happening while Peter was trying to finish and develop the Mk 2 Emeryson Elfin. 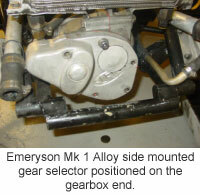 Peter drove the Mk 2 with the Emeryson Experimental Ford 105E engine at Brands Hatch, Cadwell Park and Mallory Park but was unable to continue further engine development. Due to the uncertain financial resources after the end of the association with the directors of the consortium at Send, Peter closed down Emeryson Experimental and proceeded to work as a chassis design engineer for Ford Motor Co. Ltd. In Peters own words; “It seemed that although Paul and I could not work together in harmony, we were not able to consistently produce significant success on our own.’ The brothers had no contact from this point on, the only information Peter having of Paul was via the press. Peters commitment to Ford precluded any direct involvement with motor racing. 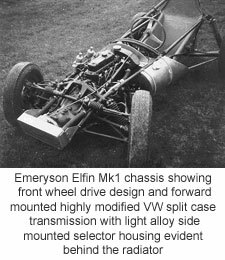 The Mk 2 Emeryson Elfin although having the same chassis and body design as the Mk1 was fitted with the highly modified the Emeryson Experimental Ford 105E engines with light alloy rocker housing. It had tubular duralumin pushrods, variable acceleration cam profile, steel camshaft and cast light alloy sump casing incorporating the main bearing housings. 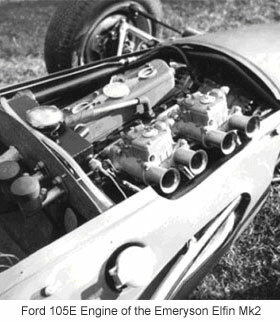 It was one of the only two engines ever designed, the other having been built, prepared and supplied to Emeryson cars and fitted to the car that won the 100 mile Commander York Trophy. 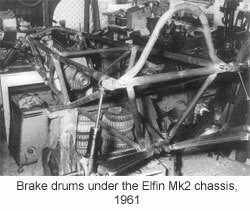 The car had four ELFIN drum brakes, two inboard and two outboard in the front and two smaller ELFIN drums at the rear. 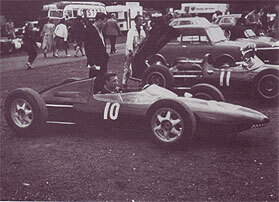 Emeryson Cars, Pauls Send based organisations first car appeared at Brands Hatch in August 1960 in F2 Guise. The car was fairly conventional for the times. Rear engined, front independent, unequal length wide spaced tubular wishbones and coil spring damper units. The rear was by independent unequal length narrow angle reverse lower wishbones, coil over damper units and adjustable twin radius arms. Pauls company built four Mk2, appearing in 1960 to compete in Formula Junior. All were similar to the Formula One cars, only having lighter gauge chassis tubing Ford 105E 997cc engine and modified VW 4 speed gearbox. The F1 cars having Colotti five speed gearboxes, mated to Climax FPF engines. Mike Spence as works driver who was later to make his F1 debate in an Emeryson-Climax at Solitude, was to achieve the only significant win for Emeryson cars, in one of the Formula Juniors, in the 100 mile Commander York Trophy at Silverstone. 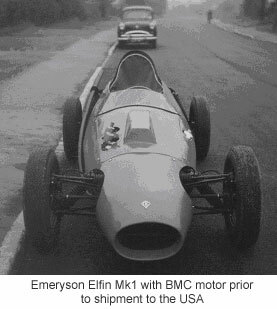 The car using the highly modified Emeryson Experimential, Ford 105E 997cc Engines designed and built by Peter, that had been removed illegally from his home. 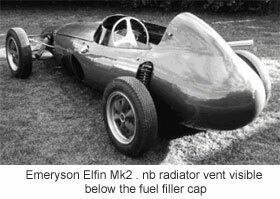 The Coventry Climaxed engined Emeryson Formula 1 car appeared in 1961. 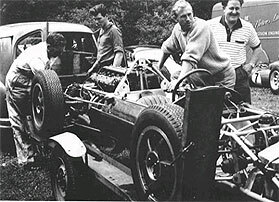 Drivers for the works team were Bruce Halford, Jack Fairman and Mike Spence who also scored Emeryson’s F1 cars best result, a second place on 1st October 1961 in the Lewis-Evans trophy at Brands Hatch. A further three F1 cars were sold to Ecurie National Belge, fitted with Maseratis 150S engines of Four cylinder dohc 1584cc, 140bhp capacity, driving through Colotti five speed transmissions. Two were to crash heavily at Pau in the team’s first event. That winter Ecurie National Belge decided to rebuild the Emeryson chassis and along with new twin nostril nosed bodies, the cars were renamed ENB-Maseratis. They were entered in several races but typically if they turned up they failed to qualify. 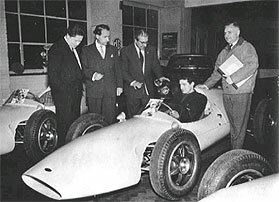 Members including driver Bianchi and secretary-general Jo Liévin of the Ecurie National Belge team taking delivery of the Emeryson Maserati F1 cars at Emeryson Cars, Send factory, – 1961. By the end of the year Paul had sold his company to American, Hugh Powell, although Paul agreed to stay on as designer and a few Mk 3 versions of the car were produced. This was slimmer and lighter than earlier cars, had a semi monocoque section with pannier fuel tanks contained in a stressed mid section. The unusual front nose on one of the cars necessitated the radiator being mounted almost horizontally with the air passing under the nose tip and up through it. The cars appeared in occasional championship races but were underpowered in comparison to the competitions V8 Climax and BRM powered cars and the best finish was a forth at the Crystal palace Trophy Race with American Tony September at the wheel. For 1962 Powell revamped the team, the cars were renamed Sciroccos and BRM V8 engines were fitted. Paul remained involved until the end of the year, when he left the organisation he established and turned his attention to engine tuning, building and Racing Hillman Imps which is a storey in itself.